A new binder material for lithium-ion battery electrodes could not only boost energy storage, but also eliminate the use of toxic compounds now used in manufacturing the components. Known as alginate, the material comes from common, fast-growing brown algae. In tests so far, it helped boost energy storage and output for graphite-based electrodes used in existing batteries and silicon-based electrodes developed for future generations of batteries. “Making less expensive batteries that can store more energy and last longer with the help of alginate could provide a large and long-lasting impact on the community,” said Gleb Yushin, an assistant professor in Georgia Tech’s School of Materials Science and Engineering. “These batteries could contribute to building a more energy efficient economy with extended-range electric cars, as well as cell phones and notebook computers that run longer on battery power – all with environmentally-friendly manufacturing technologies.” The research is the result of collaboration between scientists and engineers at the Georgia Institute of Technology and Clemson University. Working with Igor Luzinov at Clemson University, researchers looked at ways to improve binder materials in batteries. The binder is a critical component that suspends the silicon or graphite particles that actively interact with the electrolyte that provides battery power. An extract from brown algae could give rechargeable lithium-ion batteries a boost. Existing lithium-ion batteries rely on anodes made from graphite, a form of carbon. Silicon-based anodes theoretically offer as much as a ten-fold capacity improvement over graphite anodes, but silicon-based anodes have so far not been stable enough for practical use. Among the challenges for binder materials are anodes used in future batteries must allow for the expansion and contraction of the silicon nanoparticles, and existing electrodes use a polyvinylidene fluoride binder manufactured using a toxic solvent. Alginates – low-cost materials already used in foods, pharmaceutical products, paper and other applications – are attractive because of their uniformly distributed carboxylic groups. Other materials, such as carboxymethyl cellulose, can process to include the carboxylic groups, but that adds to their cost and does not provide the natural uniform distribution of alginates. The alginate comes from the seaweed through a simple soda (Na2CO3)-based process that generates a uniform material. The anodes can then come about through an environmentally friendly process that uses a water-based slurry to suspend the silicon or graphite nanoparticles. The new alginate electrodes are compatible with existing production techniques and can integrate into existing battery designs, Yushin said. Thus far, the researchers have demonstrated the alginate can produce battery anodes with reversible capacity eight times greater than that of today’s best graphite electrodes. The anode also demonstrates a coulombic efficiency approaching 100 percent and can operate through more than 1,000 charge-discharge cycles without failure. 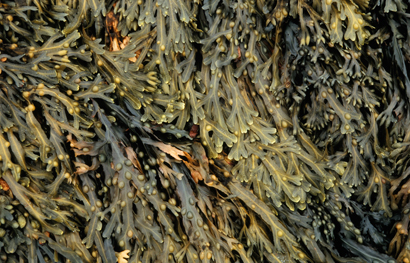 Alginates are natural polysaccharides that help give brown algae the ability to produce strong stalks as much as 60 meters in length. The seaweed grows in vast forests in the ocean and also can grow in wastewater ponds.